Alpha-galactosidase A, the enzyme deficient in Fabry disease, is a polypeptide of 429 amino acids encoded by the seven exons of the GLA gene. From the literature, a total of 599 GLA sequence changes, including 435 pathogenic point mutations (missense, nonsense, and splice site) and 150 disease causing ‘short length’ rearrangements (mainly deletions and duplications affecting less than 65 nucleotides) as well as 14 DNA polymorphisms were compiled. While no obvious mutation ‘hot spots’ for point mutations were detected, about 30% of the rearrangements occurred in exon 7, which accounts for only 22.6% of the coding region. 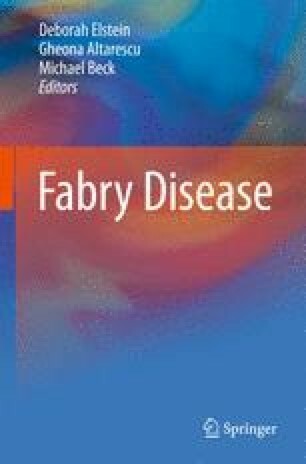 The clinical phenotype in Fabry disease can be extremely variable, both in males and females, within the same family and among patients from unrelated families carrying the same mutation. Thus establishing genotype–phenotype correlations in Fabry disease is not straight forward and usually requires the analysis of large cohorts of probands. In addition to patients with the classic Fabry disease phenotype, a considerable number of patients have been described that presented with an ‘oligosymptomatic’ phenotype, occasionally called cardiac or renal forms. This attenuated phenotype is characterized by later onset and slower progression of the disease, the patients are older at the time of major organ failure, and show a longer survival. Results of the few studies reported to date suggest that the attenuated phenotype is more often seen in patients with missense mutations than in those carrying constitutional or functional null alleles. Thirty-three different missense mutations have been reported to date in patients with attenuated phenotypes. The great majority of the residues affected by these mutations seem to be partially, mostly, or completely buried in the 3D-crystallographic structure model of α-galactosidase A. About half of the variants represent conservative amino acid changes, and only about 25% of the residues are considered evolutionarily highly conserved. While during the past years some progress has been made in the analysis of the correlation between GLA mutations and the patients’ phenotypes, there are only very few data on the phenotypic effect of other genes (so called modifiers) in patients with Fabry disease.